The Beach Boys are an American rock band, formed in 1961 in Hawthorne, California. The group was initially composed of brothers Brian, Dennis and Carl Wilson, their cousin Mike Love, and friend Al Jardine. Managed by the Wilsons' father Murry, The Beach Boys signed to Capitol Records in 1962. The band's early music gained popularity across the United States for its close vocal harmonies and lyrics reflecting a Southern California youth culture of surfing, cars, and romance. By the mid 1960s, Brian Wilson's growing creative ambition and songwriting ability would dominate the group's musical direction. The primarily Wilson-composed Pet Sounds album and "Good Vibrations" single (both released in 1966) featured a complex, intricate and multi-layered sound that was a far cry from the simple surf rock of The Beach Boys' early years. However, Wilson would soon lose control of the band because of mental-health and substance-abuse issues. Subsequently, although it released a number of popular albums (in various musical styles, with different line-ups) in ensuing years, the group never managed to reclaim its mid-'60s peak when The Beach Boys briefly challenged The Beatles both in terms of commercial and critical appeal. Since the 1980s, there has been much legal-wrangling among the group members over royalties, songwriting credits, and use of the band's name. 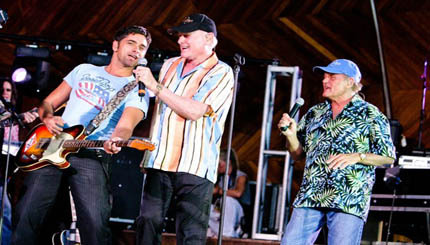 While The Beach Boys released their last studio album in 1996, a number of versions of the band, each fronted by a surviving member of the original quintet (Dennis and Carl Wilson died in 1983 and 1998, respectively), continue to tour.